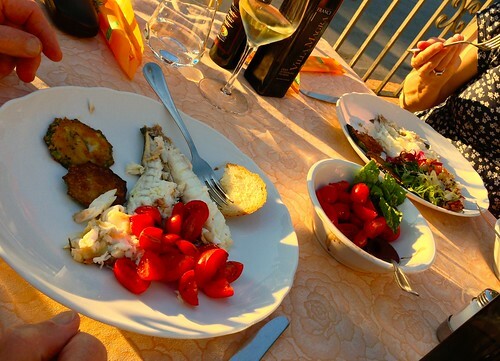 There is a fish restaurant not far from our favourite holiday destination in Tuscany. At the weekend we found some sea bream fillets in Waitrose, and this being one of Jenny’s favourite fishes I decided to try to replicate something we had at Da Remo. Ideally what I wanted to do would have been achieved on the barbecue, but there were only two of us for dinner, and we currently lack a decent grill pan. What we ended up with was better than I could have imagined, so here’s the recipe. Warm a large jamie of butter in a non-stick pan. Grind a small amount of black pepper into it. Sprinkle the bream fillets with a little freshly squeezed lemon juice and scatter over a few grains of sea salt. When you’re ready to cook, turn the heat up under the butter to full. The butter needs to be really hot, but only just turning brown. Add a couple of sprigs of fresh dill to the pan (if it’s hot enough it’ll sizzle immediately), followed by the fish, skin-side to the pan. Leave the heat on high and fry for about 3 minutes, until you can see the inside of the fish beginning to cook. Flip the fish over and fry for another couple of minutes. The skin should already be crispy and starting to brown. Flip the fish back (skin side down) for another minute to make sure the skin is really crispy (and check that the fillets are cooked through). Don’t overcook! Really—if these babies dry out it would be a tragedy. Lift the fish onto kitchen towel to blot excess butter. Serve immediately (we had boiled potatoes and peas, and a glass of Oyster Bay sauvignon blanc).